Health care providers in Plain City recently recognized the need to establish a safety net for uninsured residents. Volunteers of the Plain City Free Clinic open the doors to the new program which offers free health care to uninsured residents each Saturday morning. 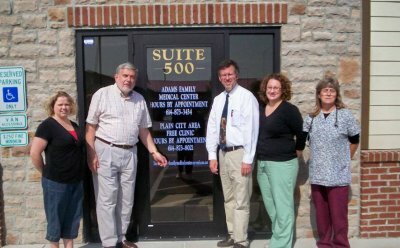 From left to right: Stacy Troyer, Charles Holcombe, Dr. John Adams, II, Kelly Gregory, and Pam Wirz. The group approached United Way for help. Dr. Adams would offer free office visits on Saturday mornings in his new facility on South Jefferson Avenue. Two volunteers, currently office staff, would handle paperwork. They’d established partnerships for most of their operational needs. But they still needed money to provide vouchers for clients to use for medications prescribed at the Clinic if they could not afford them. United Way volunteers awarded the Free Clinic an $1,800 grant in September. The Free Clinic opened its doors the next month, and anticipates seeing up to 15 patients a week when fully operational. The clinic will offer all of the services Dr. Adams would provide in a normal, routine office practice. Accute care kind of things, like sore throat, flu, chronic situations of blood pressure, diabetes, or respiratory issues. It's not an urgent care. But the group has already been successful in their efforts. For more information about the services offered by the Free Clinic or to make an appointment, call (614) 873-8021. Volunteers are also needed.